If you're starting a goat herd, you will know that goats require some knowledge to feed them right. Whether raising goats for meat, establishing a dairy herd, or just practicing sustainable living on your homestead, goats need attention to their nutrition to thrive. One good rule of thumb: don't make drastic changes to your goats' diet all at once. Don't feed them large amounts of new food. Either of these practices can lead to a major digestive upset for your goats. Change their diets slowly, giving the bacteria in their rumen (their first stomach, made for the initial step in the digestion of the plants they eat) time to adjust. Goats are well-known for their ability to pasture on anything from lovely green grass to scrubby woods, where they can eat young trees and hardy shrubs. They are browsers versus grazers (for example, cattle, sheep, and horses are grazing species). For this reason, they are excellent at clearing rough, overgrown land. Let go of the myth, if you've heard it, that goats make good "lawnmowers." They would prefer to browse if given a choice. Goats are ruminants, animals who eat plants and digest them through a four-compartment stomach. However, they are more like deer regarding nutrition than they are to sheep or cattle, which eat lots of grass. In fact, goats should not eat a diet of entirely fresh grass. 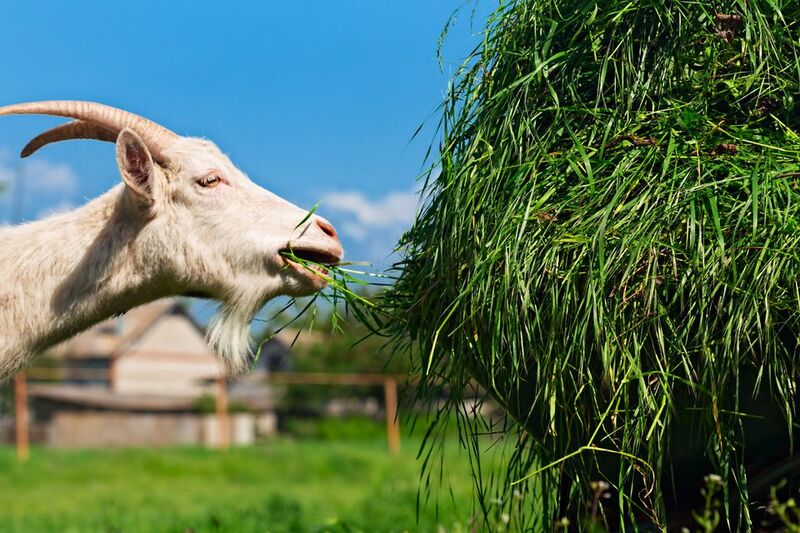 Hay is the main source of nutrients for goats apart from their range. It's what they mostly eat in the winter when they don't have access to the range. Hay can be grass or a legume, like clover or alfalfa. Each goat needs about two to four pounds of hay per day, minus what they might forage on pasture. Hay can be fed free choice or twice a day. If a good range isn't available, dry grass hay of a horse quality is acceptable. Goats require additional hay, which is roughage, for their rumen to function properly. The long fiber is necessary for this. The rumen is the first stomach compartment, rich in live bacteria, that begins to digest the fiber. A healthy goat has a large rumen that feels spongy. Alfalfa hay is also popular for feeding goats and has more protein, vitamins, and minerals than grass hays, typically. It can be a good choice for feeding milkers as it has more calcium as well. Chaffhaye is made by cutting early alfalfa or grass, chopping it, mixing it with molasses and a probiotic culture called bacillus subtillis and vacuum-packing it. The hay ferments in the container, adding beneficial bacteria for the goats' rumens. Chaffhaye can be fed as a hay alternative, with more nutrient density than hay. One 50-pound bag of chaffhaye equals roughly 85 to 100 lb of hay. Grain feed or pelleted grain mix can add protein, vitamins, and minerals to your goats' diet. Most farmers supplement with grain feed when necessary - such as does who are raising multiple kids or in bad weather - but foraging and browsing is the foundation of good goat nutrition. Grain should not be overfed: it can make goats fat, cause illness and even death. Some goat farmers like to have a livestock nutritionist formulate a goat pellet for use when supplements are needed. The local livestock nutritionist can tailor the feed to your area conditions, minimizing problems. You can also have your hay tested to add to the information that your livestock nutritionist will use for formulating this feed. Loose minerals formulated for goats should be offered free choice. Feed minerals individually, not in blocks that contain combinations of them. Goats will do fine eating your compost, for the most part. Egg shells can be problematic, but most other basic kitchen and garden compost is fine for goats as long as they're used to it. Raisins and corn chips, just a few, or a slice of bread, make nice "treats" for goats but don't overdo them. You will also need some equipment for feeding your goats. Nothing fancy, but storing hay in a manger will help goats access it and waste less. And food containers or buckets will also help reduce waste. Metal or plastic feed storage containers with tight-fitting lids will keep pests out of your feed. Of course, your goats need access to fresh, clean water at all times. You may want to raise your water bucket off the ground onto a platform or in an old tire, so it's less likely to get kicked over or pooped in. In winter, you will need to use a waterer heater so that your goats' water isn't freezing cold and doesn't turn to ice.